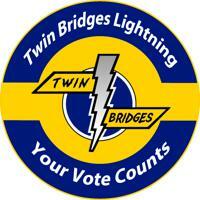 Online Voting opens the Friday before the Annual Meeting and closes at least 24 hours before the Annual Meeting. A link to cast your vote using the Online method will be sent to the email address used to register your child for the previous season. Results from Online Voting will be gathered and made public AFTER the Paper Ballot voting is completed. Please check your Clutter/Junk/Spam folders if you feel you have not received the link to the Election after it opens. A member that has not participated in the Online Voting can complete and submit their vote via paper ballot at the Annual Meeting. A family can cast a vote for up to four (4) of the possible candidates. Where multiple votes are cast for one nominee on a single ballot, only one vote will be counted for that nominee. Where there is a tie vote, a one week run off will occur following the same practices that were used in the initial nomination of directors. The nominee who gains a majority in a run off of only the tied nominees shall be elected. Where a tie cannot be broken by repeated votes of the membership, the Board of Directors will appoint the director.